T IS NO SECRET that St. Josemaría Escrivá had a great love for the Old Mass. He was one of the few priests who obtained an indult from the Vatican to continue celebrating the Tridentine Mass after the Second Vatican Council. Here are some pictures, which you might have seen before, of Msgr. Escrivá celebrating the Traditional Latin Mass. I would like to draw your attention to a few details that show the Masses he celebrated were in the Extraordinary Form. If you look carefully, you will see him wearing the maniple on his left hand, the altar cards on the altar and in front of the tabernacle, and the host being placed on the corporal instead of on the paten. S YOU CAN TELL, St. Josemaría definitely knows how to appreciate true beauty. A lot of people in the Church like to criticize that. They think that one should save money on vestments, sacred vessels, sacred art and other decorations in the church, and give those money to the poor. St. Josemaría saves the best for God. He and his companions lived very simply and they serve the physical poor through their daily works. In the Mass, they feed those who are poor spiritually by bringing Jesus to them through the sacraments and the beauty of art. In the secular world nowadays, we definitely need true art in our churches so that people can see God, who is the source of all beauty. 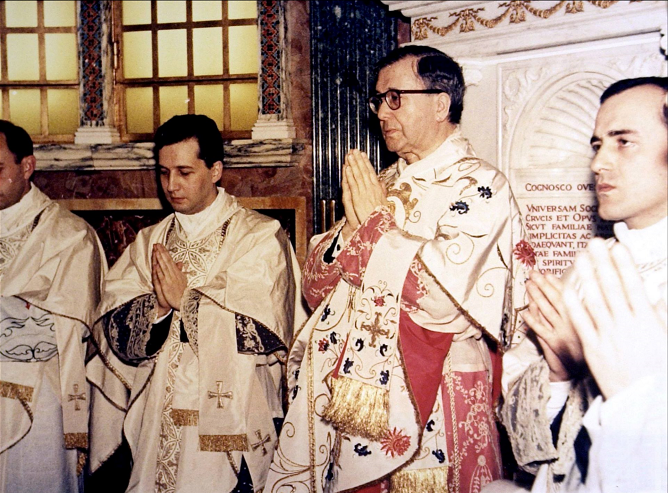 HERE IS ANOTHER rare and interesting picture of St. Josemaría accompanied by other priests. I really have no clue what occasion this might be. You can see the maniples on the priests’ arms and their stoles were crossed underneath their chasubles. Could this be a concelebrated Mass or an Ordination? Please share your thoughts on our Facebook Page.